Martin Lloyd-Evans' production of Italo Montemezzi's opera L'amore dei tre Re was first given at Opera Holland Park in 2007, when it seems to have been the first professional production of the opera in the British Isles since Wexford Festival produced it in the 1970's. The opera made a welcome return to Opera Holland Park this year and we caught the second performance (25 July 2015). 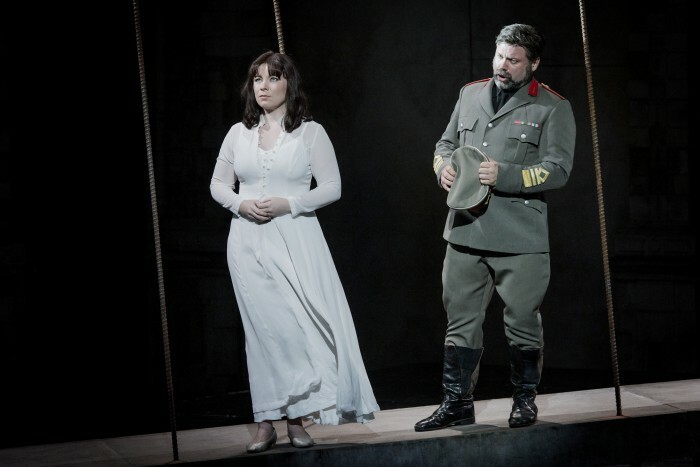 Natalya Romaniw sang Fiora, with Joel Montero as Avito, Simon Thorpe as Manfredo, Mikhail Svetlov as Achibaldo, Aled Hall as Flamino and Lindsay Bramley as an old woman. Peter Robinson conducted the City of London Sinfonia, and the designs were by Jamie Vartan. The plot is simple. Many years ago Achibaldo conquered the country Altura and married Fiora, princess of Altura, to his son Manfredo despite the fact that Fiora was betrothed to Avito. In a series of tense encounters we learn that Fiora still love and is loved by Avito and the two take advantage of Achibaldo's blindness to meet when Manfredo is away. Act Two concludes with Fiora and Avito's rapturous love duet, interrupted by Archibaldo who kills Fiora in his attempt to learn her lover's name. So far so Wagnerian, with nods to Debussy too. But in Act Three, the body of Fiora lies in state, Avito comes in disguise and kisses it. He falls ill and Manfredo informs him that Archibaldo has put poison on Fiora's lips to discovered the identity of Fiora's lover. But then Manfredo too kisses Fiora, he loves her too, leaving Archibaldo to discover the body of his dead daughter. 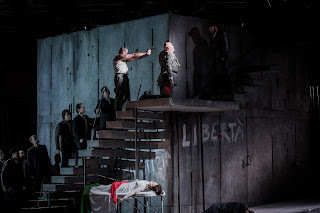 The libretto is based on the play by Sem Benelli (an admirer of Gabriele d'Annunzio) and is an example (along with Richard Strauss's Salome) of the 20th century exploration of texts taken directly from plays. There are nods towards the symbolist dramas such as the Maeterlinck which inspired Debussy, as well as the darker areas explored by 20th century German and Austrian composers. Italo Montemezzi (1875 – 1952) was born near Milan and studied at the Milan Conservatory. L'amore dei tre Re was his third opera and first major success. It premiered at La Scala in 1913 and is often seen as a last flowering of Verismo but Montemezzi's sound world is a long way from the post-Verismo school and, influenced heavily by Wagner, he seems to combined late Puccini with Richard Strauss and a heavy admixture of Debussy. A rich, heady mix which uses a big orchestra and requires powerful yet lyric voices. Lasting a little over 90 minutes (Opera Holland Park played it without an interval) the pacing of the piece is excellent. Montemezzi uses the orchestra to point the protagonists state of mind and explore the emotional undercurrents of the drama. Gloriously rich and intense, the music moves and is powerful, yet is full of lyric impulses too. This asks lot of the singers, both soprano and tenor are required to produce endless supplies of lyric line yet rise above an orchestral score which is itself highly passionate and rich. You could imagine, in the wrong hands, that the opera would fall quite flat but Opera Holland Park drew on a very strong cast indeed. Natalya Romaniw sang Fiora with a brilliant, gleaming line and her voice flowed beautifully all evening, cutting through the orchestra yet with a flexible line too. It made me regret that she died in Act Two and did not get a Wagnerian apotheosis. Beauty, yet intensity too, with a sense of the vividly vibrant passion which runs through Fiora. Natalya Romaniw is in superb voice at the moment, exploring the edges of the jugend-dramatisch roles and singing with a lovely mixture of power, flexibility and gleaming tone. So far, her career has showed good head for keeping the voice on track and I look forward to future roles, but do catch her now if you can. She was well partnered by Joel Montero, a trifle stiff in his stage demeanour perhaps but he sang the taxing tenor part with firm heroic tone and a nice evenness through the range. His duet with Natalya Romaniuw had a great sense of endless rapture from both of them. And the Act Three encounter with Manfredo bristled with tense passion. 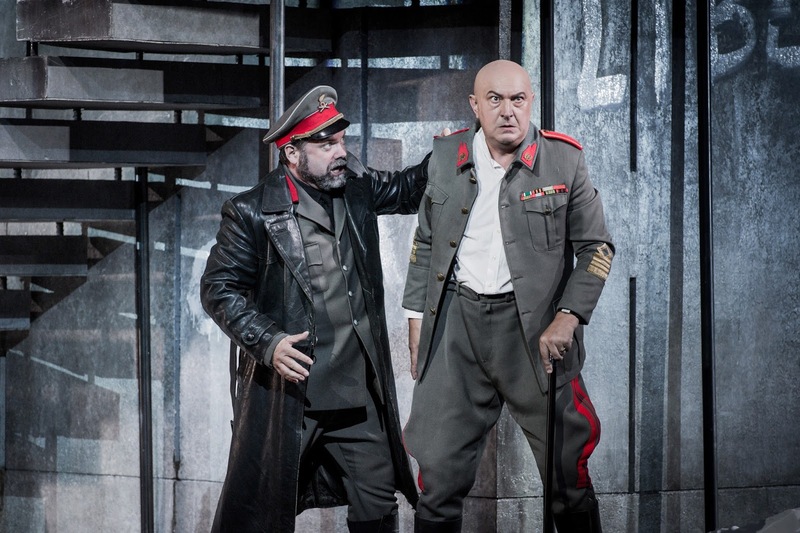 Intriguingly the two real adversaries in the piece might be seen as Avito and Archibaldo yet they never meet. Simon Thorpe brought power and freedom to the role of Manfredo, a character who seemed to be doomed to come on late at the end of each act. But Simon Thorpe made the combination of power and intensity count and his final scene, kissing Fiora's poisoned lips, was powerful. The real engine of the drama was Mikhail Svetlov's Archibaldo, a really intense, vicious character. Mikhail Svetlov not only looked convincing as a blind man, but drew searing violence into his voice in a thrilling way. Aled Hall in the role of the servant Flamino, (a native of the area, sympathetic to Fiora yet serving Archibaldo) made much of relatively little and played a pivotal role in moments of drama. Lindsay Bramley was an old woman, mourning with the chorus at the opening of Act Three. Martin Lloyd-Evans production, designed by Jamie Vartan, took place in and around a concrete structure, all platforms and staircases which looked unfinished. 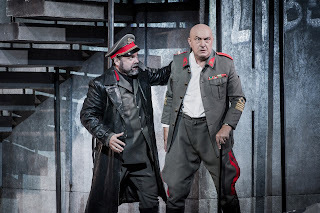 the production had a sense of taking place in the recent past, Fascist Italy, which gave background to the drama without pressing the parallels too much. What Martin Lloyd-Evans did do as create a series of tense and often thrilling encounters with the tension never letting up. None of the protagonists is all that admirable and it is clear that Fiora has a manipulative streak whilst Avito is woefully underwritten and we end up feeling sorry for Manfredo who loves the woman who despises him because of what his father has done. Montemezzi's music surrounds them with a luscious late Romantic score, but Martin Lloyd-Evans drew on the vivid drama of the score to create mesmerising drama. In the pit Peter Robinson conducted a large City of London Sinfonia (triple woodwind, four horns, three trumpets, three trombones) which was quite a challenge in a theatre like that of Opera Holland Park which does not have a pit. It is to both Peter Robinson and the orchestra's credits that they produced a vibrant, passionate account of the score and only occasionally were the voices in danger of being covered, but never did it feel like a tone poem with added voices. The title (The Love of the Three Kings) arises because, in Montemezzi's view, Achibaldo is also in love with Fiora though this did not really come over in the production. Montemezzi's story is to some extent tragic. His next opera, La Nave failed and he never properly returned to full scale operas. It is difficult to envisage how the style used in L'amore dei tre Re could be extended but on its own terms the piece is thrilling. And it is richly to Opera Holland Park's credit that they brought this challenging opera back with such a thrilling cast.